NEW YORK Ka-ching! 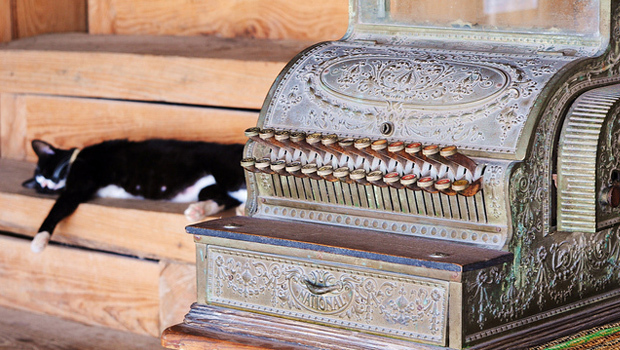 The cash register may be on its final sale. Stores across the country are ditching the old-fashioned, clunky machines and having salespeople - and even shoppers themselves - ring up sales on smartphones and tablet computers. Stores like smartphones and tablets because they take up less floor space than registers and free up cashiers to help customers instead of being tethered to one spot. They also are cheaper: For instance, Apple's (AAPL) iPads with accessories like credit card readers can cost a store $1,500, compared with $4,000 for a register. And Americans increasingly want the same speedy service in physical stores that they get from shopping online. "Consumers want the retailer to bring the register to them," said Lori Schafer, executive adviser at SAS Institute, which creates software for major retailers. As a result, companies that make traditional cash registers are racing to come up with new solutions. NCR (NCR), formerly known as the National Cash Register, was the first to manufacturer the cash register on a large scale. Stores themselves also are taking their cues from the success of Apple. The nation's most profitable retailer moved to mobile checkout in all of its stores in 2007. In 2011, Apple began allowing shoppers to check out their purchases using their iPhones. Take upscale handbag maker Coach (COH), which is using iPod Touch devices at half of its 189 factory outlet stores. The company also is testing them in a handful of its 350 regular stores. The move has enabled Coach to start slimming down its registers to the size of small podiums, freeing up space on walls to build shelves to showcase more product, said Francine Della Badia, Coach's executive vice president of merchandising. Della Badia, who says the additional space will be used for new shoe salons and other purposes, said most importantly, the mobile devices allow store staff to build "a more intimate connection with the customer." Some retailers have decided to go completely mobile. Urban Outfitters (URBN), which operates more than 400 stores under its namesake brand, Anthropologie and Free People, announced in late September that all sales eventually will be rung up on iPods and iPads on swivels located at counters. The company didn't give a timeframe for when it would go completely mobile. Nordstrom (JWN), an upscale department-store chain that's considered within the retail industry to be the gold standard in customer service, also plans to get rid of registers altogether. Not every retailer is quick to ditch registers, though. After all, there are still logistics to figure out. For instance, most retailers don't accept cash payments on mobile devices. But if they start to do so, where will they put the cash that would normally go into a register? Additionally, sales staff walking around stores armed with mobile devices could turn off shoppers who would prefer to be left alone in aisles. Richard Robins, a 67-year-old semi-retired investment fund manager from Redonda Beach, Calif., says he would like the convenience of mobile checkout but wouldn't want to be pressured from a sales clerk while he's in the aisle. "I don't want to be hustled," he said. To guard against making customers uncomfortable, some retailers including Penney are training their salespeople on when to approach shoppers - and when not to. For its part, Wal-Mart (WMT) is putting checkout in the hands of the shoppers themselves.